I’m sure the majority of you feel the same way about traveling. It is super fun and exciting but exhausting at the same time. The good news is that there are little tools we can use to make traveling (even long-distance) a bit more comfortable. Today, I want to share with you my top 5 neck pillows. Let’s see which one turns out to be the best travel pillow and your loyal companion for any distance. 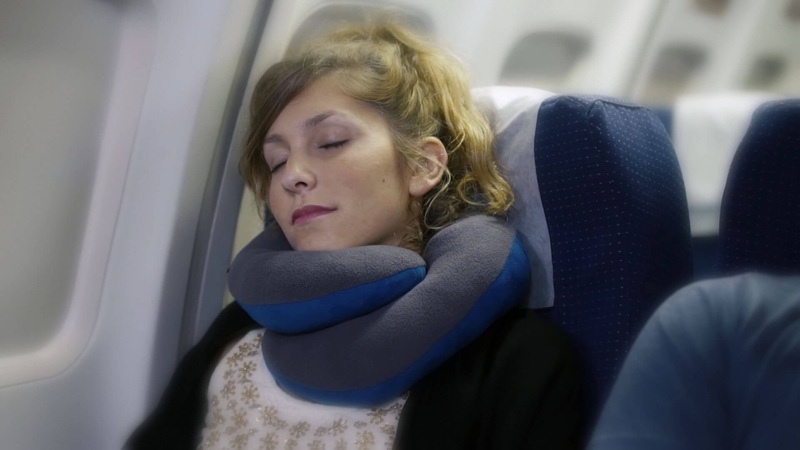 The reason why this model can be called the best neck pillow for travel isn’t that the manufacturer claims that its effectiveness is scientifically proven. In my opinion, this pillow deserves to be on the list simply because it’s very comfortable. Besides, it won’t take much space in your bag because it’s half the size of a regular U-shaped travel pillow. And it weighs only 136 grams, which makes it one of the most compact travel pillows on the market. It is able to hold your neck in an ergonomic position, allowing you to fall asleep and preventing your neck from stiffness and pain. It is very small and lightweight, which makes it perfect for any kind of transport. It is made of soft fleece and foam, which means it is stretchy and adjustable. The strengthening plastic ribs are hidden inside the fleece and provide extra support for the neck. This neck pillow is machine washable, which will make the after-travel cleaning process much easier. The best thing about this pillow is the support it provides. When using it, my head wasn’t wobbling around, and the neck was fixed and comfortable. It gets better: I slept through the whole 5-hour flight and didn’t even wake up for the snacks (and have no regrets). The worst thing about this model is the fact that you have to adjust it really tightly if you want your head to be fixed. And to some people, that might be too tight, too uncomfortable, and even cause anxiety if those people are claustrophobic. Overall, I’m rather happy with this neck pillow. I think it is suitable for any kind of transportation and has a potential to become your most favorite, best neck pillow for travel. This neck pillow is super soft, comfortable, and adjustable. What makes it stand out among competitors is the enhanced support for the chin that it provides. If you often find yourself waking up because your head falls down, this is a great pillow for you. It can be used in different positions and you can control how tight it is around your neck. The Chin Support system prevents the head from falling forward. Comes in two sizes, for kids and adults. The cover is made of fleece and suede fabrics. The filling is the conjugated siliconized fiber. 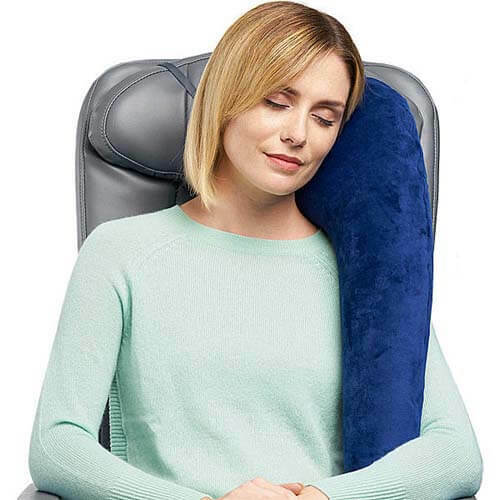 The coolest thing about this neck pillow is the variety of sleeping options it provides. Moreover, they all feel comfortable. You can put it on one shoulder and rest your head on it or, for example, wrap it around your neck and put the chin on the pillow. It is adjustable, which is a great plus, especially when you want to change the sleeping position from time to time. The worst thing about this pillow is its size, to be more exact – the amount of filling inside. It’s quite a thin pillow, compared to the ordinary U-shaped neck pillows we are used to. And I think it might not be suitable for taller people or people with longer necks. To be honest, I enjoyed traveling and using this pillow. It is easy to adjust and provides great support. I feel like this neck pillow can become a great travel buddy for pretty much anyone. This pillow proves that cheap doesn’t always mean bad. 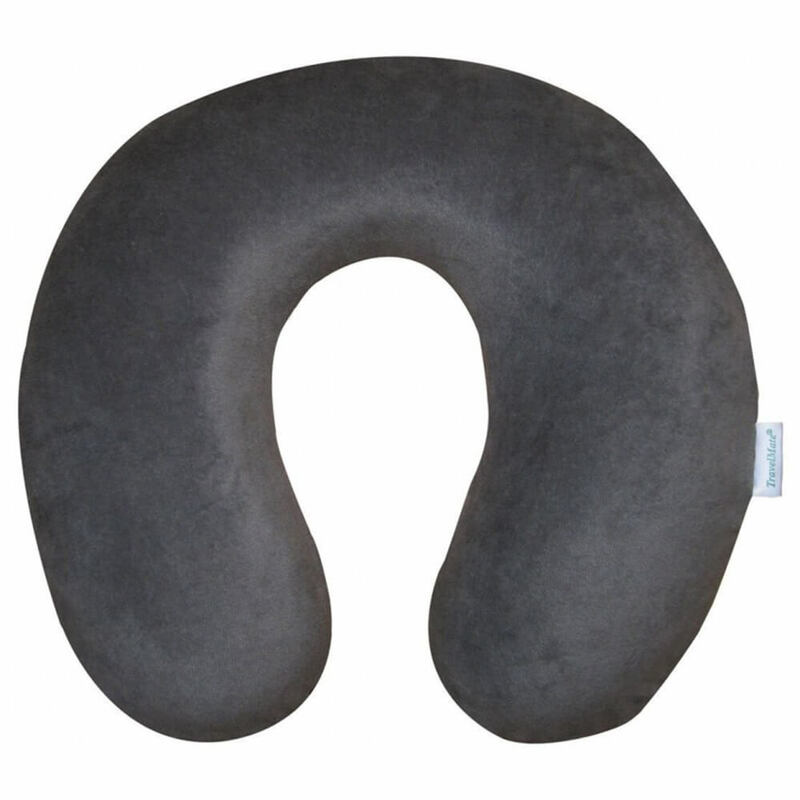 The Travelmate Memory Foam Neck Pillow is very reasonably priced, however, it works quite effectively. It can accompany you on your every trip, and it won’t require much effort on your side. The thing is, this pillow has an elastic strap that allows you to easily attach it to your luggage without the need to spare the space for it inside the bag. It has a classic U-shape, which can support your neck and head. The foam insert at the back is removable, which allows you to regulate the pillow’s thickness. It is filled with memory foam, which provides firm support and a slight cushioning effect. The best thing about this pillow is the combination of its price and quality. Yes, it doesn’t feature all those luxurious details, and its shape and filling are rather simple, but it still works. The worst thing about this model is the stiffness of the filling. If you’re used to firm pillows, you might be okay with it. But if not, this neck pillow might seem too hard for you. This pillow is a perfect model for people who prefer simple things. It offers decent support and can be considered as one the best pillows in this price category. Another contestant for the honor to be called the best travel pillow for long-haul flights is this model by Travelrest. What makes this pillow perfect for long flights is the use options it provides. Being equally comfortable for both adults and kids, this pillow keeps your head, neck, and body in proper alignment. The fact that it doesn’t take much space because it’s inflatable makes it a very compact and ergonomic option. This model is inflatable, which means you can easily carry it around and use in its full size only when needed. It is able to provide lateral support for the upper body, which can help you fall asleep and have some rest on the go. It does a great job supporting the neck properly and feels very comfortable, especially for side sleepers. 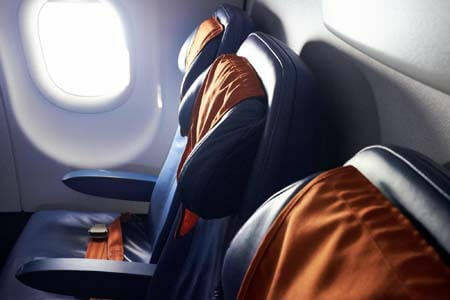 You can twist it almost any way you want to, adjusting the pillow to your seat and position. It is machine washable, which means you’ll have no trouble cleaning it. The absolute best thing about this neck pillow is the fact that it’s not exclusively for your neck. You can use it in multiple positions, for example, across your body or down the side of your torso. By offering such versatile use options, this pillow can be comfortable for anyone. The worst thing I’ve noticed about this model is the fact that it won’t stay in the upright position unless you attach it to your seat. However, some airplane, train, and bus seats don’t have a headrest, to which you’re supposed to clip the pillow using its stripe. So, it might not work effectively depending on the transport you’re using. To tell you the truth, I had no complaints when using this pillow. I repositioned it once or twice, found the best position, and fell asleep. This product is soft and supportive at the same time, which makes it a great option for traveling. The pillow’s back part is flatter than that of most other pillows on the market, while the height of each side is higher. Such a design will keep your head in one stable position and allow you to relax more effectively. Besides, there’s a pocket on one side, so you won’t have to hold your phone or MP3 player in your hands if you prefer to fall asleep listening to something. This pillow is filled with high-quality memory foam, which is able to support the head and the neck properly. For an additional chin support, you can rotate the pillow in 360° and rest your chin on it, preventing your head from falling forward. It features the media pocket for your cell phone or MP3 player. The pillow’s cover is removable and machine washable, for an easier after-travel cleaning. The best thing about this pillow is how comfortable and supportive it is. It is soft and, honestly, feels like a good bed pillow. It supported my head perfectly when I wanted to lean it to the side. Also, I tied the front stripes quite tightly, and it helped me stop moving my chin and my head forward. The worst thing about this pillow is that its foam filling might make you feel hot. Of course, it’s usually chilly on the planes, so the pillow will only make you comfier. But if traveling by train or by bus during the warm season and with no air conditioning, this pillow might be just too hot. In general, I had a great time traveling and using this pillow. It felt soft, it supported my head and neck perfectly, and it didn’t let my head fall forward. 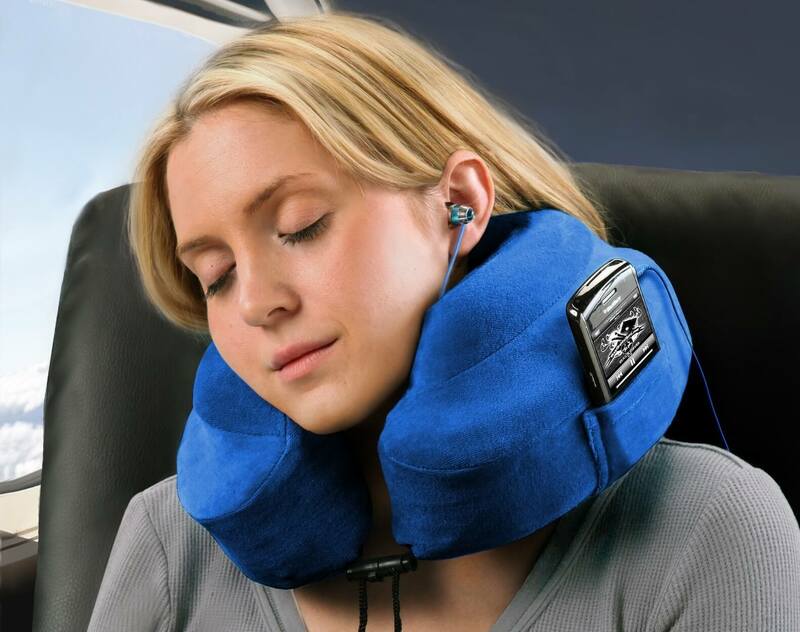 I think this is an excellent option not only for travelers but also for people who want to relax at home and provide some additional support for their neck. Shape. Although the most common shapes are a U-shape and a ring-shape, there are much more designs available. Some of them are rather unique and unusual, which may cause some doubts in terms of their ability to provide comfort. That’s what we’re here for. 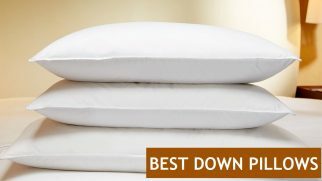 We test pillows of different shapes and recommend only the ones that really work. Material. Most travel pillows you can find on the market today are either memory foam or inflatable. The cover may be made from polyester, velour, or fleece. Each of these materials has its own distinct characteristics, which we consider when reviewing a pillow. Adjustability. Loft is the most important factor that defines your comfort. The most common complaint from travelers as to their travel pillows is the insufficient support due to a low loft. That’s why many manufacturers began designing pillows that can be adjusted depending on your neck’s height. Adjustability also refers to the positions in which you can use your pillow. Compactness. Size and weight matter for travelers too. 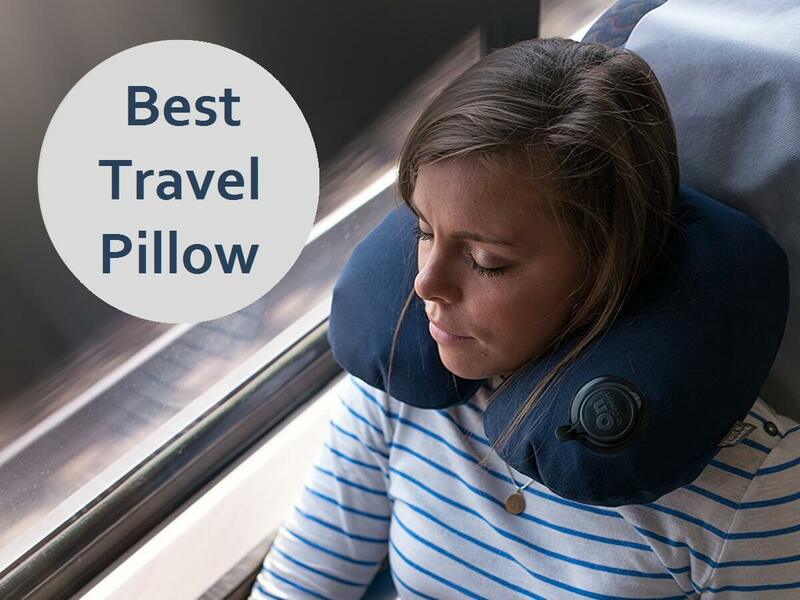 Even the most comfortable travel pillow in the world won’t be praised too much if it’s too bulky and heavy. The most compact models are foldable and inflatable. Ease of cleaning. Travel pillows get dirty much faster than bed pillows, and it’s obvious, as they travel with you everywhere. Also, drooling is a pretty common (and annoying) issue among people who sleep in a sitting position. That’s why we look for fully machine washable models or the ones that can be easily spot cleaned. 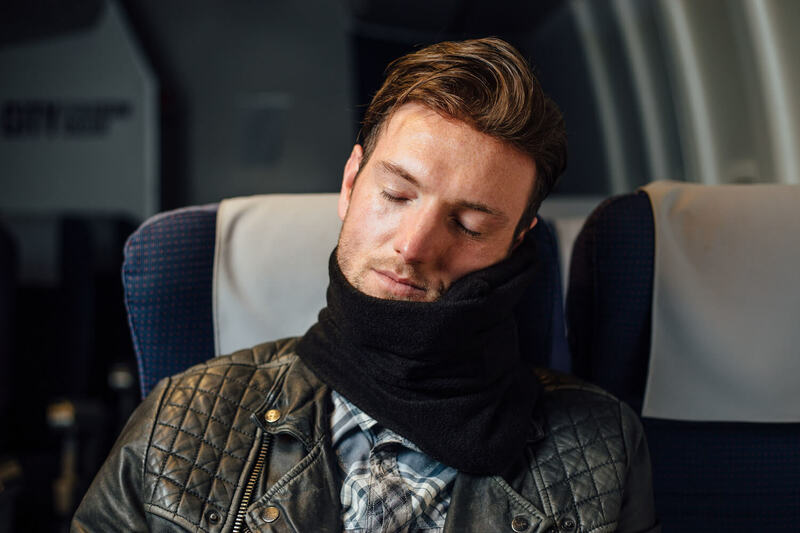 Some airlines offer pillows to their passengers, but those usually measure 3 inches or less, which is too thin to maintain proper support throughout your trip. Typically, a travel pillow will cost you $10-$40. Inflatable pillows don’t need to be fully inflated to feel comfortable. In fact, you may feel much more comfortable with a pillow that’s 90% inflated if you’re used to softer pillows and have a smaller head. Some inflated pillows will need to you manually inflate them by breathing in oxygen, while others can have an automatic mechanism launched by a button. Non-inflatable pillows are usually large and bulky so they might seem not convenient for carrying around. However, most modern designs feature a special mechanism that allows you to attach your pillow to your luggage. Some manufacturers offer travel sets that include a mask and earplugs in addition to a pillow. Most travel pillows are not covered by any warranty. Yet, it doesn’t mean the manufacturer has made them low-quality and just doesn’t want to have any responsibility for that. Drink enough water. Staying hydrated directly affects your sleep. Wear loose and comfortable clothes. An airport isn’t a fashion podium and you don’t have to wear a suit or high heels. Wearing something comfortable will help you sleep better. Reduce the stimuli. Turn off your phone or laptop and get those screens away from your face. Wear a sleep mask to eliminate the light. And a pair of good earplugs will block the irritating sounds, allowing you to have a restful sleep. Don’t eat too much. Feeling heaviness in the stomach won’t let you fall asleep easily and might ruin your whole flight. I must say, trying to pick the best travel pillow made me experience many peaceful hours on the plane. But the one that made me feel the most comfortable was the Cabeau Evolution Memory Foam Travel Pillow. It fits my neck and head perfectly and feels like a real pillow. It managed to keep my head and neck straight and even supported my chin. I think this pillow can improve any travel experience. Which pillow would you take on your next trip? Share your opinion in the comments! I have made a nearby passenger develop an interest in Ultimate travel pillow. The fact that i inflate and deflate it at will gives that ease of moving around with it. Unless you take a good look at me, you wouldn’t know am sleeping. I usually look like am resting or catching fun while using Ultimate travel pillow. What is the durability of the Bcozzy chin support, my kids are on a short holiday and it’s time to tour, they realistically need this. Each of them will make their choice anyways but Bcozzy will be my strong suggestion to them. I have a serious obsession with sleep, this has made be sleep in several places. Being a person who likes long travel duration, I’ll need to get the Soft Neck Support Pillow, so i can enjoy the trip all the way. Besides, does it have any after effect?